After 5+ weeks of waiting and wondering about our camping future, the Fireball finally returned, complete with its new axle. That was Tuesday afternoon. By noon Wednesday, we had packed up and headed off to explore a new campground (to us) in the Huron-Manistee National Forest, about 70 miles from home. Rain? Who cares? Unseasonably cold? So what? Part of our excitement was that we could finally try out the new modifications we made to the Fireball since returning from our winter trip. First, we decided to remove the TV/DVD, which we never used. Besides being in the way, it took up space we wanted to use for storage of maps, brochures, and all the other little stuff one picks up on a long road trip. This is our solution. This little metal basket, which I spraypainted red, works great for holding stuff. In addition, it’s a great spot to dump our tablets and phones while they’re being charged. We give this little mod an A+. Another mod was designed to increase (my) comfort on long trips. One thing that I really miss is having a spot where I can put my feet up. Crazy, but true. We don’t carry the lounge type of camping chairs, and our small dinette just didn’t give me a spot to sit comfortably for long periods. (John and Jezzy hang out on the bed). So, we decided to permanently take out the dining table, beef up the cushions with a memoryfoam layer below, and add back cushions. We purchased a small “C” table with a butcher block top, which I painted shiny red and coated with several layers of polyurethane. Love this so far, but we need to change the back pillows – they’re not quite right yet. But, it really feels like we’ve got a lot more space inside now. The table is bungy’d into position during transit to keep it from slamming around. We had torrential rain for over 24 hours on this trip, and having spots for both of us to stretch out was heavenly. One more small improvement is our new outside doormat. It’s made of recycled flipflops – colorful and durable. This scrapes sand off our shoes so much better than our last one. Love the funky colors as well. 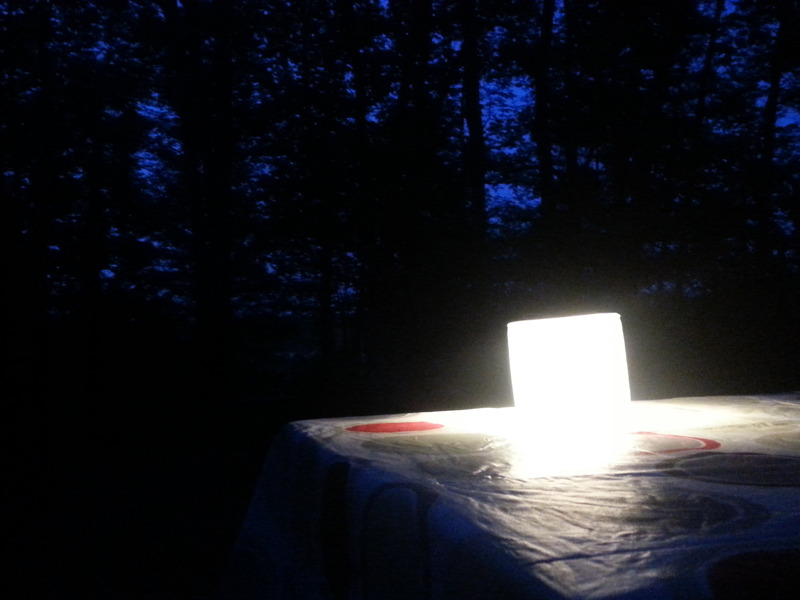 John invested in a Luci Lite, a solar-rechargable lantern. Bright and light (it weighs about 2 ounces). This will be perfect for tent camping as well. 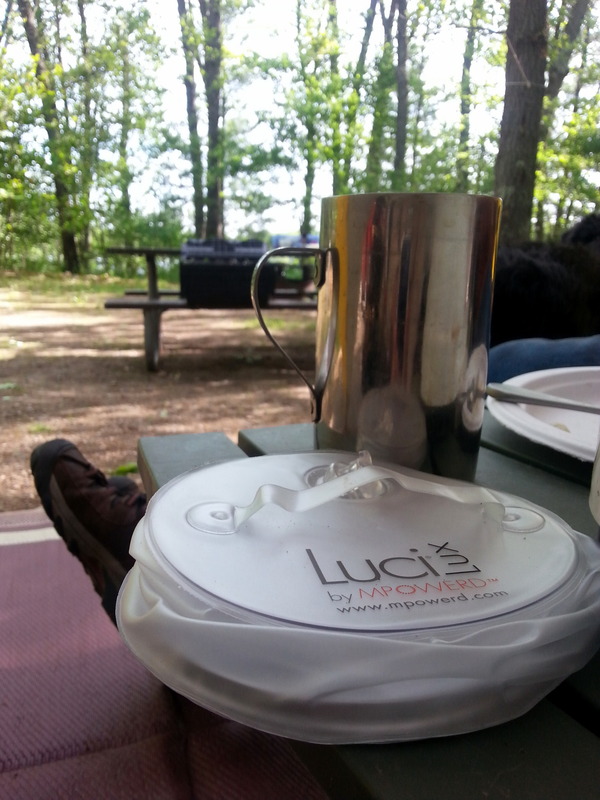 The Luci Lite blows up like a beachball and folds flat when not in use. Perfect! So…..we’re camping! 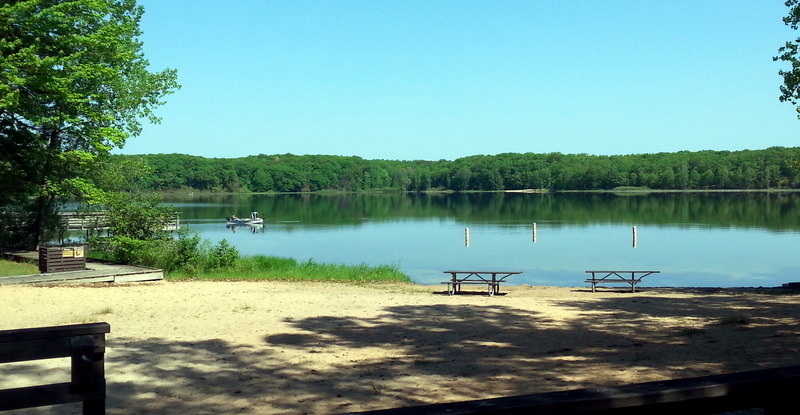 We chose well for the campground, and had a nearly perfect campsite – great view of the lake, firepit not too close to the Fireball, and plenty of clearing for our solar panels. There’s no electric hookup or water at each campsite here, although there were flush toilets and one shower. It’s a great setup – $8/day with our federal geezer pass. There’s even a swimming beach. 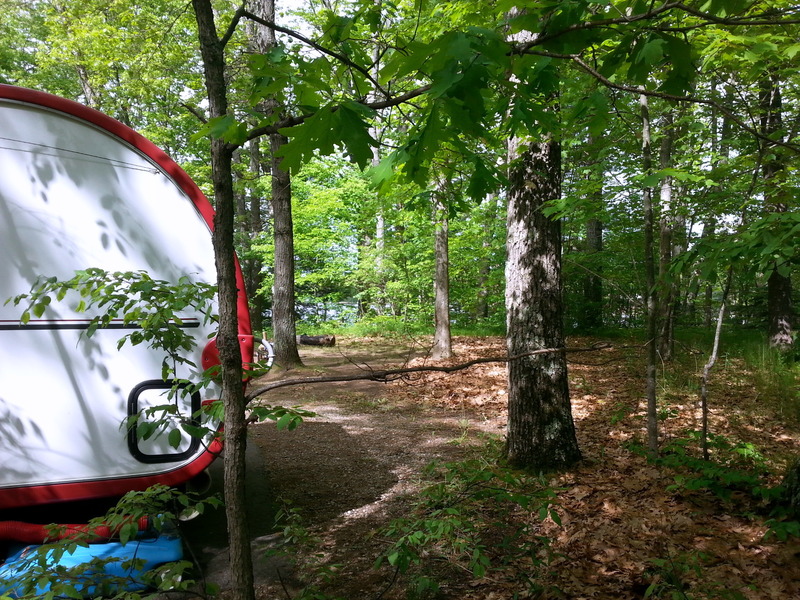 Another attraction of this campground for us was its proximity to the North Country Scenic National Trail, which runs 4,600 miles from North Dakota to New York. We got settled in on Wednesday late afternoon – the rain stopped by the time we pulled into the campground. Thursday morning, we made our favorite camp breakfast and decided to go for a hike. “Uh, Houston….we have a problem,” says a voice through the window as I’m pulling on my hiking socks. “Haha, it looks like I brought one of your hiking boots and one of mine.” (Note to self: Judy, next time, pack ALL your own stuff. Don’t let John touch any of it!). This dilemma ensures that we won’t hike for miles and miles – John needs his boots because of foot problems. I can trudge along in my sandals for the most part. We set off anyway, figuring to hike until foot discomfort turns us back. In our relatively brief hike (about five miles), we did discover several things. 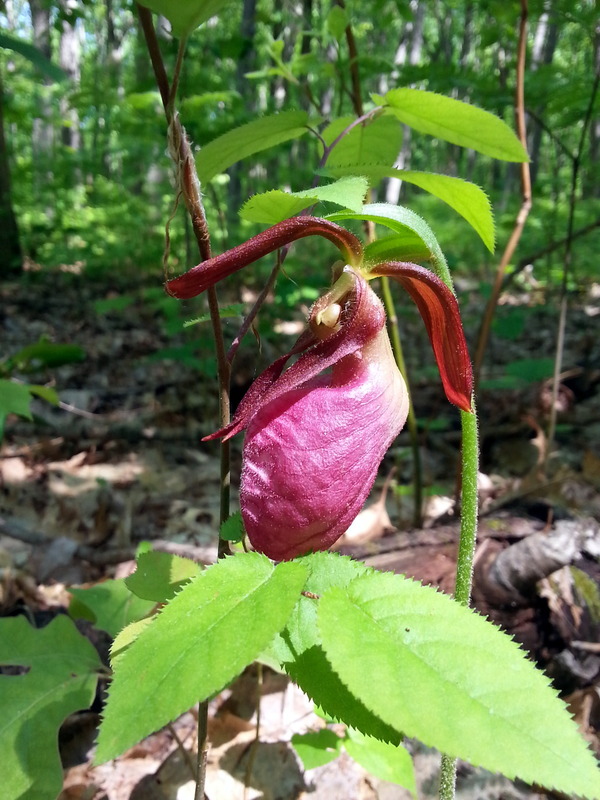 This gorgeous Lady Slipper orchid, all by itself alongside the Trail. We were curious about what must have caused the twist in these trees. There must have been something big and shady during their early years to cause them to twist into the sun. It was odd to see this little grouping – they really stood out! 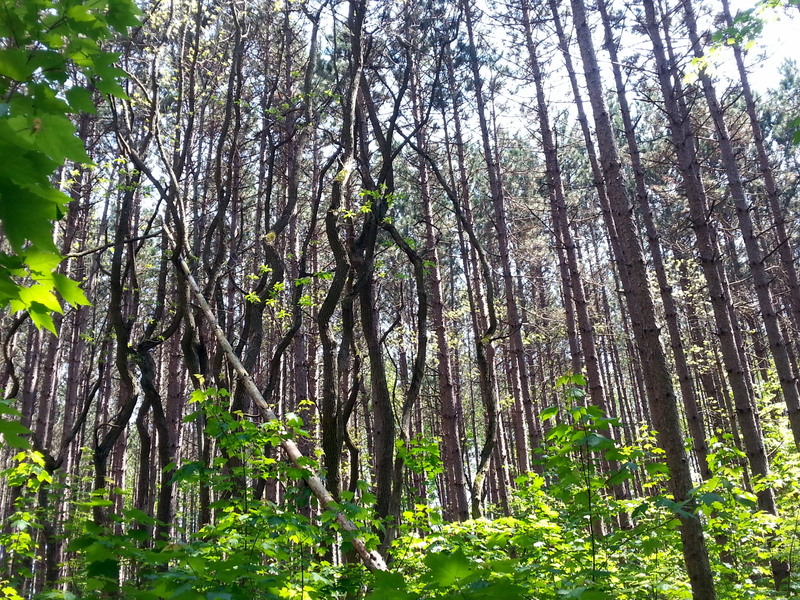 As we hiked, we became aware that there was a sharp division in the forest. Hardwoods on the right (we were on the northbound Trail), and pines on the left. The Trail split them. There was no crossover – it was startling to see such a demarcation. Couldn’t really get a photo, so just take my word for it, ok? There were no land features that seemed to account for this division, but in sections, it was very pronounced. Another oddity – no squirrels! Never saw even ONE in the five days we camped. Jezzy was crushed – that’s the highlight of her camping experience. We didn’t hike any notable distance, but were happy to have acquainted ourselves with another section of the North Country Trail. 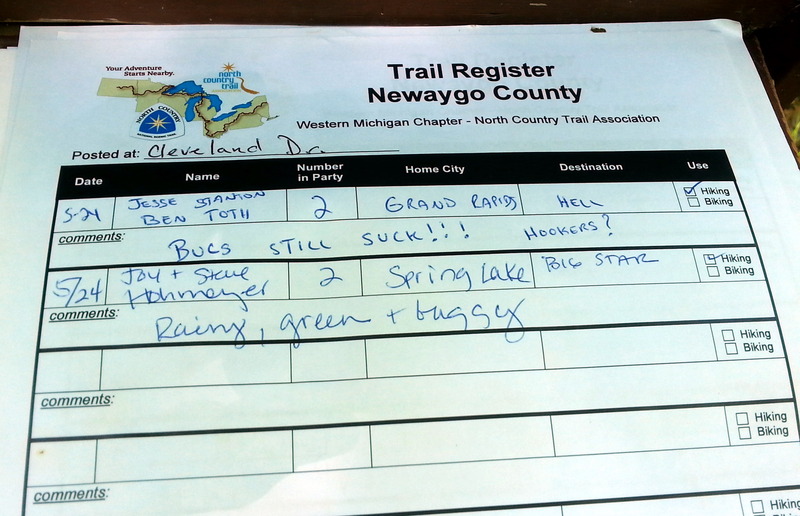 Last year, when we camped our way across northern Michigan, Wisconson, and Minnesota along Lake Superior, we bisected the Trail in many spots. Our footprints may not go far on the Trail, but we’ve laid them down! Lounging around camp that afternoon, John reported that there was an opportunity for me to fulfill my wish to be a Trail Angel. What??? 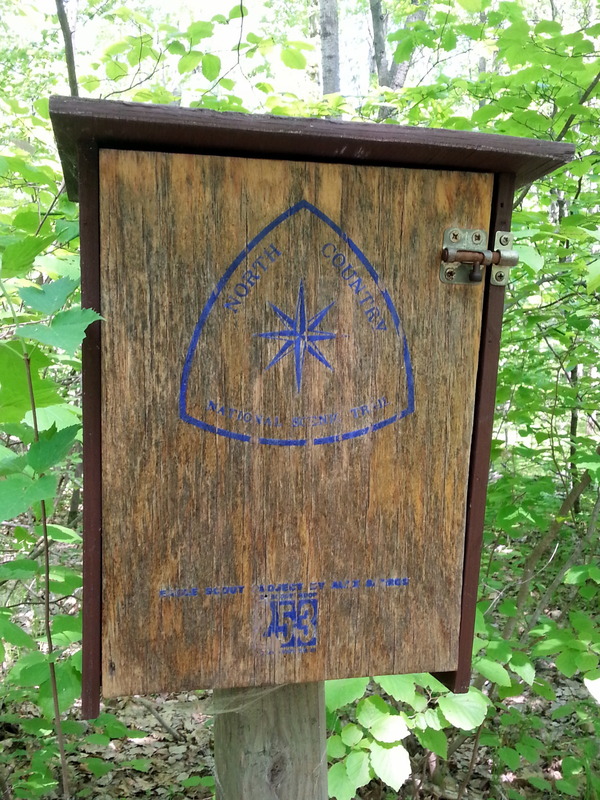 Trail Angels are individuals (or groups) who help hikers with food, water, or shelter. There are legendary Trail Angels on the Appalachian Trail, the Pacific Crest Trail, and out in the Arizona desert, where Angels leave water and supplies for border crossers. In our case, there was a grizzled hiker, propped up against a tree near the bathroom, waiting for his cellphone to charge. (There’s a power outlet in the bathroom). I wandered over to offer Dave a sandwich and a beer while he waited. Oh boy! This hiker needed a hand. He mumbled something about low blood sugar, but could barely talk. I pointed out our campsite, and asked him to come over for a comfy sit and some food. A beer, caffeine, whatever he would like. After a few minutes, he stumbled to our site. John gave up his Strongback Chair, and Dave kind of slumped into it. Refused a beer and a sandwich, but accepted the offer of chocolate and a cup of coffee. I gave him one of our favorite salted dark chocolate/almond bars. He asked if we had one without nuts – turns out he only has about three teeth. The nuts were a problem! After a half of a candy bar and a good coffee jolt, Dave could once again speak in full sentences. Interesting character – had been on the Trail for eight days but had only covered about 25 miles as the crow flies – probably 35 or so on the Trail. 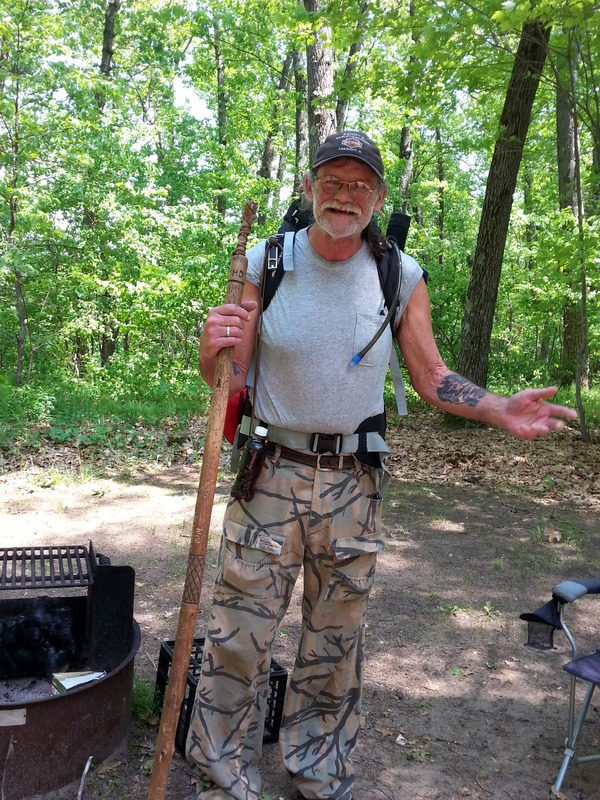 He was headed to Manistee, which he estimated as another 75 miles. I asked him if he had a time schedule, and he said that he had to be back home by July 3 for a medical appointment. I think he’s going to need all of that time at the pace he’s going. We did send him along with a banana, an orange, the rest of the chocolate, and two gallon-sized Zip Lock bags. Filled up one of his water bottles with the now-cooled coffee for another caffeine jolt down the road. Hope he makes it. 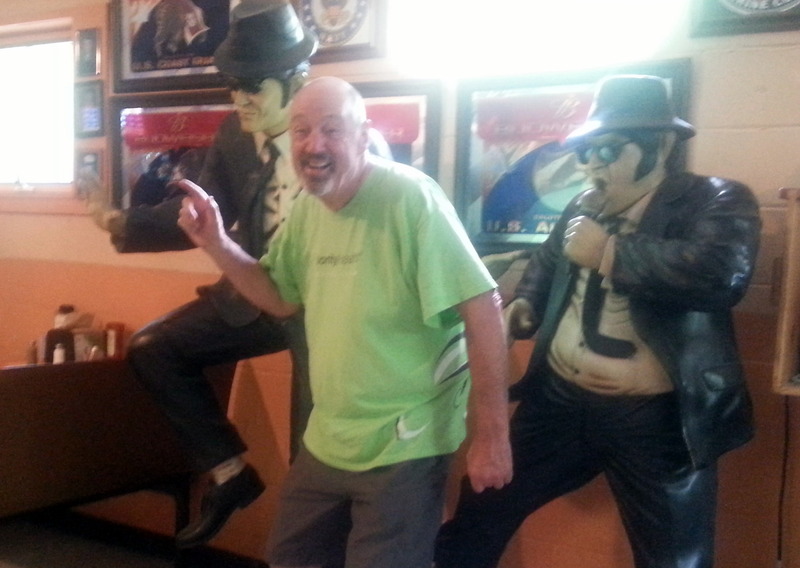 We spent one day wandering around on our bicycles, where we happened to run into the Jake and Elwood at Woody’s Bar in Bitely. You never know who you’ll find in the North Woods. The rest of the trip was a swift decline. Friday night the rain began, and continued through Saturday relentlessly. With spots for both of us to stretch out, we settled in pretty easily to a day of books and crossword puzzles, accompanied by music or NPR on our new portable radio (a Sangean, which we really love). Sunday morning was windy and cold (40’s), so we weren’t too unhappy to pack up and head home. Our long campless nightmare has ended. 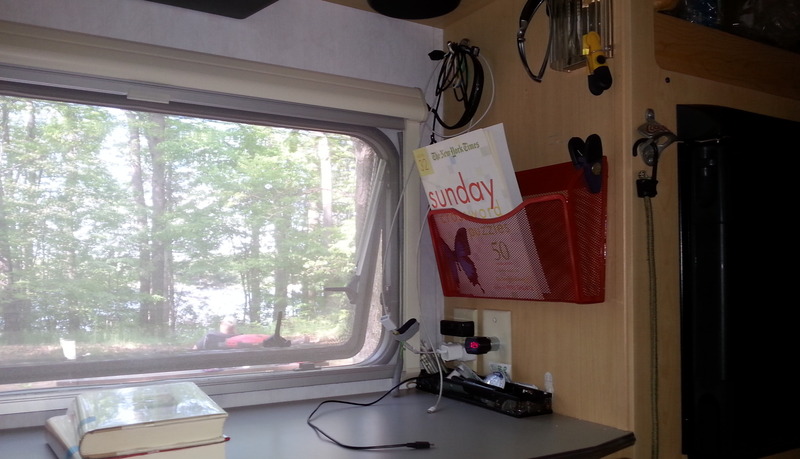 This entry was posted in camping, cycling, hiking, Michigan, retirement, RV life, simple camping, T@DA and tagged camping, cycling, hiking, Huron Manistee National Forest, Michigan, retirement, simple camping, T@DA by Judy Crankshaw. Bookmark the permalink. Maybe the Night Shift should plan a stop there. Food was reasonably good, fine beer. Thanks, Ingrid. You have no idea how happy we were to get out for a few days! We were so relieved and happy! Ridiculous, but that’s us, I guess. We are grounded for this month – June is our big money that for volunteer activities. Seems like we’ve got something going at least one night a week. But, if we get a couple of free days…..we’re outta here! Got travel plans yourself this summer? Hi, Camille. Hope that I will always want to go tent camping, but I understand that it’s an acquired taste. Most of my girlfriends can’t imagine themselves in a tent. Getting outside in whatever fashion is the best. Loved your zipline adventure. Next time we get to Moab, hope to try that, too. Woohoo by favorite blogger is back….an angel indeed! COZY home and all! I’ve missed you! Stop on my blog posts for a bit…camp volunteering in a familiar site doesn’t seem too exciting but we love our gig! Filling the pockets again..trying anyway! Ready to follow all your fun…you make me smile! Hi Carla! I’ve been missing your blog, too. Can’t decide it it’s good new that you’re working too hard to post or not. ;-). Happy that it’s not due to any bad juju though. So, life as a camp host is good? We talk about trying that, but I’m afraid that I’d get all cranky with people – no campground needs that! A great campground host really sets the tone of the place. So happy that folks are willing to work so hard to do that. I had to hike recently without proper shoes. I think that’s great that you made 5 miles. Always enjoy reading your blogs. Hey Carolyn! Boots are better, for sure. I like the added assurance of dry feet if we happen to wade thru some unexpected mud. So nice to read of your experiences once again. The bed/sofa mod is good and I’ve wondered about that myself but there’s a part of me that just really likes sitting at the dinette—even if most of that sitting happens in the driveway with a glass of wine. When we’re camping, we’re usually sitting outside. Maybe once we are on the road for longer trips the sofa will be the way to go. Give my thanks to John, Ray did the cut-out under the cupboards and we too, now have EXTRA storage space. He also built a little shelf to cover the exposed wires so that we don’t accidentally pull them out or something when shoving stuff into the space. Looking forward to seeing you in Sept! We put down a carpet scrap to cover the wires. Glad the new storage works for you too. Hi Ellalou! I’m sure we will miss the table sometimes, too. We usually eat outside, if not at the picnic table, then crouched around the campfire. Going to try hard to make the new config work, but we can always go back. Glad your cutout worked out. We keep all of our foil, saran wrap, zip locks, etc down there, as well as a little electric heater we carry, but seldom use. John also cut a piece of carpet and put it on the floor down there – just a bit of added insulation, and it keeps stuff from sliding around. so good to hear of the camper back in service with all the new alterations! I attempted to go for a 2 week camp/paint trip with friends and the road to the campground up in the Bighorns was closed due to flooding. They thought they could clear in by this afternoon but no guarantee I could get back out. So we canceled for now. Providentially my new topper window will get installed tomorrow! Really big thunderstorms every afternoon and high winds would not have been great for a leaky topper. Love the Trail Angel story. Hey, Liz! Getting stranded in the mountains probably wouldn’t be the best. But, I’ll bet that camping out there is beyond compare. Can’t wait until we can head your way – hope it will be in 2016. If you are still interested, we would love to buy one of you or whooping crane paintings. Email me or message on FB? I like your thinking on the “love seat.” It looks like you guys got rid of the pole, which by the way I HATE, then used the table top to form the base of the love seat? 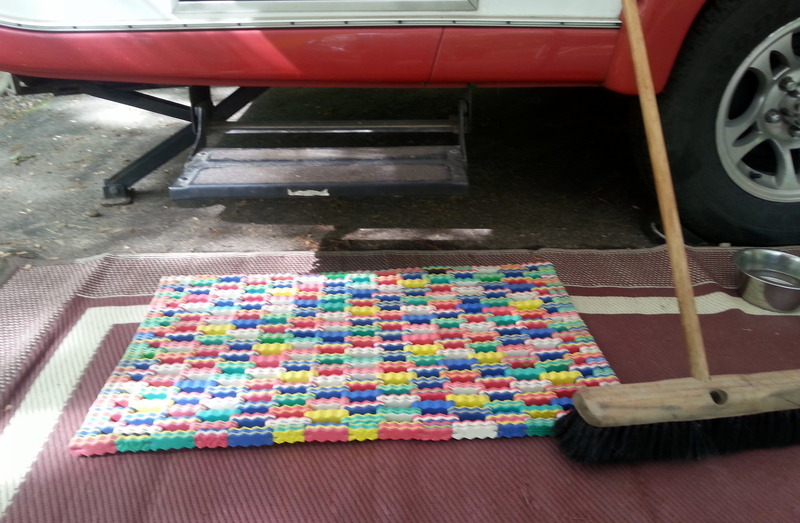 Then did you put some kind of cushion underneath the original cushions that came with the camper? We’ve been talking about making a little sofa in that spot. 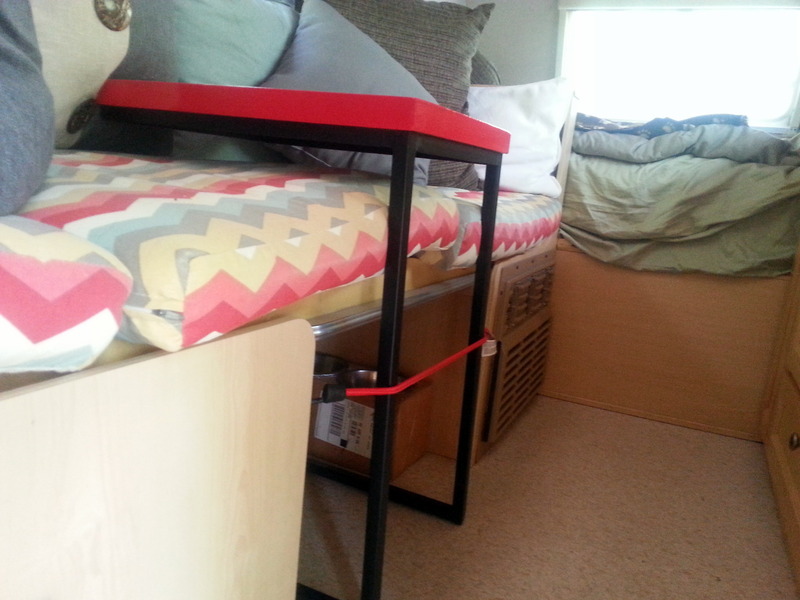 We like the dinette but it’s not that comfortable if you have to spend a lot of time in the camper. Your mods look great! Also loved the lady slipper. We used to have them all over the place when we lived in coastal New Hampshire. The one you posted was a beauty. So glad you guys are back in business! Give Jezzy a pet for us! Hi Jennifer. Yes, the table is dropped down, just like it would be if you were using it for a bed. We left the pole at home. 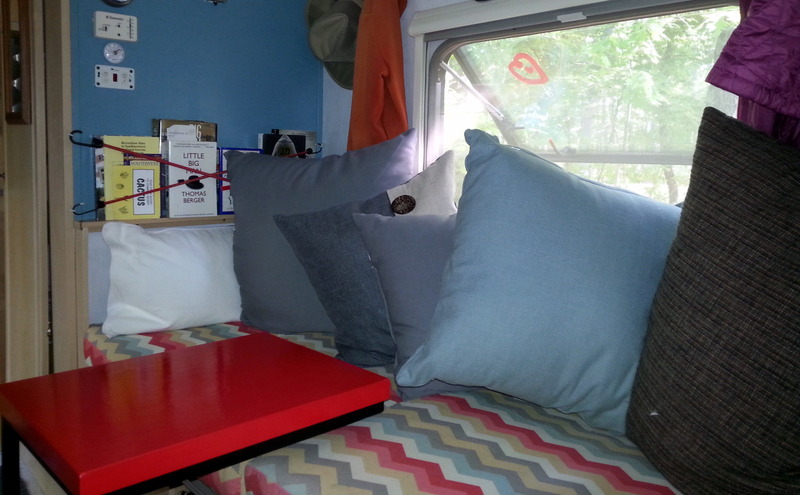 I had a foam mattress topper, which I cut and put beneath the cushinono and up the wall behind the back pillows. Not a perfect solution, but it adds a lot of support. I’d love to replace the cushions, that that high density foam is shockingly expensive. Need to find bigger fatter pillows or cushions for the back if we can. We almost always eat outside, so I think this will work. I’m sure we’re going to miss having the table sometimes. I was happy to see the ladyslipper. Love all the wildflowers, but know few by sight. I had just read a blog which featured them, so I didn’t even have to look it up! Hi Sandi. What a relief to get the Fireball back again. We are headed your way in September/Oct. Going to a rally in western MA in late September. Want to prowl around the coast a bit. I’ve never been to Boston, Providence OE anywhere out there. Other than the rally, no agenda yet. Maybe we can hook up with you for a few days?? I hope that the old guy makes it, it doesn’t sound as if he was prepared for what he was trying to do. I liked the modifications that you made to the Fireball, and I hope that the new axle holds up for you. Hi Jerry. Thanks for checking i n. Thought your schedule was supposed to lighten up a bit – hope that happens soon. 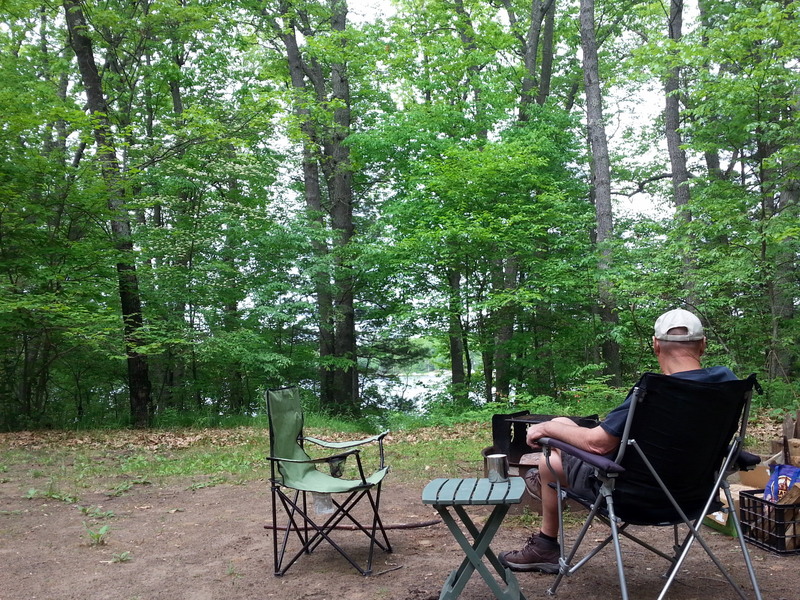 There is something so relaxing about camping…..you know what I mean. Our hiker buddy probably wasn’t any older than we are, but he had many years of hard living. Kind of that grizzled Vietnam vet kind of guy. He was pretty determined – I think he’ll make it. We do love to tinker with the Fireball. Some of the smallest things add a lot of comfort or functionality. We can’t wait to get out again, but it won’t be for awhile. Sigh…..
Glad you are back! I was thinking yesterday you hadn’t posted anything for a while. And I love your dinette elimination idea. That is one of our issues, too, and I loved having the dinette made into a bed so I could lounge on it but eating inside was a problem. And we are also thinking of installing a wire basket on the wall for our maps and such. Thanks for the ideas! We are finally getting into camping mode with a 4 night trip to our favorite hot springs resort in the mountains. Belknap Hot Springs – easily found by Googling. John and Jessie hang out on the bed??? May I suggest that Jessie take her rightful spot on the floor and John and Judy hang out on the bed?? We can sleep there, but to read or do crosswords, it’s too snug. John is too apt to throw an elbow, and Jezzy is a HUGE bed hog! A girl needs her own space.